Partly cloudy and windy. High 67F. Winds NW at 20 to 30 mph..
A clear sky. Low near 35F. Winds NW at 15 to 25 mph. Friday’s be listening between 10am – 11am to hear updates from Reede Construction with Jesse! Join in the Fun during the Fischer Rounds "Live and Logo" Hunt. One time per month we will hide the KXLG logo plate. One clue will be added to the website every day till someone finds it. If you find it turn it into Fischer Rounds & Associates in Watertown (12 5th St NE) and they will award you with $50 in Watertown Chamber Bucks! Clue #3: A different kind of dog! There is a monument in SD called the Elrod monument. Who is Elrod, and what county does it exist? Samuel Elrod was a Governor of SD, and the monument is located in Clark County. There is an island in SD, formerly known as Hog Island. What lake is it on, and what is it called today? Answer: Island on Big Stone Lake. There was a mayor of a SD city who had a different town named after him. What was his name, what town was he mayor of, what town is named after him? Answer: Thomas, SD was named after the mayor of Watertown. The SD town now known as Goodwin was once called Prairie Siding. What caused them to change the name of the town? Answer: In honor of a man killed there while working on the railroad. There is a spring in SD that took its' name from the fact that the land around it rises into a certain shape. What's the name of the spring, and what county is it located in ? Answer: Horseshoe Springs, Clark County, SD. How many natural lakes are there in the state of SD, and which lake is the largest natural lake? Answer: 257 and Big Stone Lake. What is the longest non-cave, above ground tunnel in SD? Answer: The 57th Street tunnel in Sioux Falls. There was a time when the US Army was nervous in this area. Because of that, they named four lakes in honor of soldiers stationed in this area. Name those four lakes. Answer: 2 Mile, 4 Mile, 6 Mile, and 9 Mile. That's how far they were from Ft. Sisseton. In 1983 Watertown Mayor Herb Jenson was mentioned by Dan Rather in a story on CBS News. Why was that? Answer: He got involved in the Perpich/Janklow argument after Perpich said SD was last in everything. Before the Captain 11 Show started, Dave Dedrick traveled to a big city to learn about working with kids. Who did he meet with? Answer: Jim Lange from the Dating Game. The Watertown Hide & Fur Company was a booming business in 1926. What occupies the building where it was then? Answer: The now destroyed Harbor Bar building. Pierre, South Dakota is the only capitol and state that don't share any of these. What are they? Answer: letters of the alphabet. In the Deadwood gold rush days, they had a trick to save the gold dust that was lost. What was that trick? Answer: They panned the sawdust off the floors. In 1967 in Lemmon, SD, a project called "hail-swath" was hosted with a goal in mind. What was the goal? Answer: Cloud seeding to make it rain. Name the Watertown insurance agent and the hotel where he used to be a barber. Answer: Vince Bruggeman at the St. Hubert Hotel in Milbank. Few people realize that shortly after the end of World War II the governors of South Dakota, Nebraska and Wyoming formally invited the United Nations to establish their headquarters in the Black Hills. The request was taken seriously and plans were developed for the United Nations complex to be built near Custer, SD. Only one nation voted in favor of the idea. Which country voted to establish the UN in the Black Hills? May 27, 1929 was a life-changing event for this South Dakotan. Who was it, and what happened? Answer: John "Potato Creek Johnny" Perette, found a 7.3 troy ounce gold nugget. The largest in state history. Trains killed the stagecoach industry in SD. Ending the last stage company. That stage company ran between which SD towns? Answer: Aberdeen to Leola. Stagecoach rules in 1876 requested that you abstain from alcohol. But, if you must drink, they made one request. What was that? Answer: You had to share. In Madison, SD in 2018 there was a unique event held with a very Mexican flavor. What was it? Answer: Running of the bulls. A man in the Black Hills of SD was down on his luck until he had a dream that created an empire? What was the dream? Answer: FL Thorpe created a Black Hills gold factory after dreaming of a grape design..
Why is it that owls, squirrels, rabbits, and various other animals don't have to worry about creating their own housing in the wild? Answer: They move into underground housing created by other animals. In WWII the military asked us to save something from the kitchen that was used for explosives? Answer: lard and grease. Calvin Graham is believed to be the youngest service man ever to enlist and fight in WWII. How old was he, and where did he serve? Answer: 12 years old on the USS South Dakota. Kristi Noem and Warren Green share more than one thing in common. What are they? Answer: They both have been elected Governor, and both lived near Hazel. The Homestake Gold Mine had eighteen of these. While statistics showed other mines in the nation had six. What were they? Answer: fatalities in a typical year. Little Sophie Creek is a tributary of the Moreau River. Who was it named for? Answer: Sophie Herbert who operated the 24 Ranch had the creek through her land. A lawyer from New York was on a business trip to the Black Hills region of SD in 1884. While he was there, he asked a question that made him a household name. What was it? Answer: He asked what the granite outcropping in that mountain was called... They said it didn't have a name, so Charles Rushmore got it named in his honor. How and where did Brig. General Richard E. Ellsworth die? Answer: He died in Newfoundland. Where is the only thatched roof building in the Midwest? Answer: Wessington Springs. Spies Super Valu in Watertown was a significant participant in making Curt Carlson of Minneapolis a multi-billionaire. How did they participate? Answer: Gold Bond Stamps. What was the unusual item that was on display at Barrette's Sport Shop in downtown Watertown? Answer: Mounts of water birds. The building at 30 N. Broadway in Watertown has been home to at least five different bars. Name two of them. Answer: Johnnie's Bar and The Club. South Dakota, at one time, was home to the world's largest conveyer belt. Where was it located? Answer: Homestake Gold Mine. The Valedictorian of the Watertown High School Class of 1949, and her husband ran a successful business in Watertown for 17 years. What was her name, and what was the business? Answer: Mae Meseberg - Canteen Bar. In 1933, Clem's Palm Garden in Watertown was the first establishment to do this. What was it? Answer: Sell beer after prohibition. Broadway was formerly known as Oak Street, until what month and what year? Answer: November 1914. Kenneth Rassmussen was a veterinary in Watertown. John Palmer was his partner. When they retired, they sold the business to who? Answer: Dr. Ed Larson. Memorial Park and the Grand Army of the Republic memorial were paid for by the American Legion Post 17. The funds were drawn from what account? Answer: World War 1 wartime funds that were left over. August 7, 2018: Watertown Post 17 American Legion recently earned a distinction that has never happened in the state before. What is it? Answer: First time that both the state legion commander and the state Sons of the American Legion commander were from the same community. July 30, 2018: There is an organization who's goal is to protect the economic lifeline to rural and small communities, which is a critical resource for business, medical care, disaster relief, and a key transportation asset to isolated areas. What is the name of that alliance? Answer: Alliance for Aviation across America. July 19, 2018: Where is home plate from the, Fred Haas Park in Webster, and why? Answer: Canova has it, because they got to take it after they won the state 12 & under state tournament. July 16, 2018: Which South Dakotan, at an early age, took an interest in drilling and perfected deep water well drilling? Answer: Peter Norbeck. MAY 22, 2018: WHAT WAS THE NAME OF THE FIRST NEWSPAPER PUBLISHED BETWEEN HURON AND PIERRE, AND WHAT YEAR DID IT BEGIN? ANSWER: HAND CO. PRESS IN 1882. MAY 21, 2018: HOW LONG MUST A PERSON LIVE IN SD TO QUALIFY FOR THE SD HALL OF FAME? ANSWER: THERE IS NO SPECIFIC AMOUNT OF TIME. JUST SOME PART OF YOUR LIFE. MAY 14, 2018: TEN GRADUATES OF USD HAVE ALL RECEIVED THIS SCHOLARSHIP, AND EVENTUALLY ALL SERVED IN THE SAME ROLE. WHAT WAS THE SCHOLARSHIP, AND WHAT ROLE DID THEY FILL? ANSWER: RHODES SCHOLARS THAT BECAME JUDGES. MAY 4, 2018: IN 1920 A CONTRACT WAS SIGNED TO BUILD A HIGH SCHOOL AT A COST $225,000. THE BUILDER WENT BROKE AND THE SCHOOL WAS NOT COMPLETED. THE COMMUNITY CAME TOGETHER AND FINISHED THE PROJECT. WHAT CITY WAS IT, AND WHERE WAS THE NEW BUILDER FROM? ANSWER: WEBSTER AND CLEAR LAKE. MAY 3, 2018: WHAT ARE ALL THE NAMES THE COLLEGE NOW KNOWN AS DAKOTA STATE UNIVERSITY HAS BEEN KNOWN BY (IN ORDER) IN THE PAST? ANSWER: EASTERN STATE TEACHERS COLLEGE, GENERAL BEADLE STATE TEACHERS COLLEGE, GENERAL BEADLE STATE COLLEGE, DAKOTA STATE COLLEGE, DAKOTA STATE UNIVERSITY. APRIL 24, 2018: THIS EARLY DAY BARNSTORMER TRADED TWO CARS FOR AN AIRPLANE IN 1919 AND WENT ON TO LOG MORE THAN 43,000 FLIGHT HOURS. HIS LAST FLIGHT WAS ON HIS 100TH BIRTHDAY. WHAT WAS HIS NAME, AND WERE WAS HE FROM? ANSWER: CLYDE ICE FROM MILLER AND PIERRE. APRIL 19, 2018: US OLYMPIC QUALIFYING FOR THE SKI JUMP USED TO BE HELD IN SD. NEAR WHAT TOWN WAS IT HELD, AND WHY DID THEY STOP USING IT? ANSWER: NEAR CANTON AND IT BLEW DOWN IN A STORM. APRIL 13, 2018: CORSON EMMINGER BUILT IT. WE'VE ALL ADMIRED IT IN CODINGTON COUNTY. WHAT IS IT? ANSWER: THE ROUND BARN SOUTH OF WATERTOWN. APRIL 12, 2018: SOUTH DAKOTA WAS ALSO ONCE HOME TO ANOTHER RIVER BOAT CALLED THE "NELLIE MAY". WHERE DID THAT BOAT CALL HOME? ANSWER: JAMES RIVER. APRIL 6, 2018: WHAT WAS IT THAT GROUNDED THE SIOUX QUEEN? ANSWER: A DAM TO THE SOUTH WASHED OUT AND DRAINED ALL THE WATER TO THIS PART OF THE RIVER. MARCH 16, 2018: THE WINNER OF THE FIRST SPIRIT OF DAKOTA AWARD CAME FROM WHICH SD CITY, AND WHAT'S HER NAME? ANSWER: WINIFRED LORENTSON FROM MILLER. MARCH 14, 2018: WHAT SD COURT HOUSE IS MADE WITH BLUE ALASKA MARBLE? ANSWER: HAND COUNTY IN MILLER. FEB. 13, 2018: HOW DID THE JAPANESE BRING WORLD WAR II TO SOUTH DAKOTA SOIL? ANSWER: THEY TIED BOMBS TO BALLOONS. FEB. 12, 2018: WHAT DID LAURA INGALLS WILDER WRITE ABOUT IN HER FIRST BOOK, AND WHO ENCOURAGED HER TO START? ANSWER: WISCONSIN AND HER DAUGHTER. FEB. 7, 2018: WHAT WERE THE FIRST TWO CITIES IN SD TO BE SERVED BY THE RAILROAD? ANSWER: YANKTON AND VERMILLION. FEB. 5, 2018: WHO WAS CREDITED WITH NAMING YANKTON THE FIRST CAPITOL OF DAKOTA TERRITORY, AND WHO GAVE HIM THE AUTHORITY TO DO SO? ANSWER: JBS TODD, ABRAHAM LINCOLN'S COUSIN-IN-LAW. FEB. 1, 2018: LEWIS AND CLARK WENT ON AN EXPEDITION STARTING AT THE MISSOURI RIVER AND TRAVELED ALMOST 8000 MILES. WHAT WAS THE PROPER NAME OF THAT EXPEDITION PARTY? ANSWER: THE CORPS OF DISCOVERY. JAN. 31, 2018: WHY WOULD IT BE LOGICAL FOR A THINKING MAN TO BELIEVE THAT THE RESIDENTS OF SENECA, SD ARE INDIFFERENT TO, OR UNAFFECTED BY GRIEF, PLEASURE OR PAIN? ANSWER: THE MAN SENECA WAS A STOIC. JAN. 9, 2018: LEWIS AND CLARK REPORTED "BARKING SQUIRRELS" IN THE AREA THAT IS NOW KNOWN AS WHAT COUNTY, AND WHAT WERE THEY REFERRING TO? ANSWER: GREGORY COUNTY AND PRAIRIE DOGS. DEC. 22, 2017: WHO WAS THE FIRST USD GRADUATE TO PLAY IN THE NFL? ANSWER: ORDELL BRASSE. DEC. 21, 2017: IN 1942, AN ORGANIZATION MOVED INTO SIOUX FALLS FOR A FEW YEARS, THEN LEFT. WHEN THEY LEFT, THEY LEFT TERRACE PARK TO THE CITY. WHAT WAS THE ORGANIZATION? ANSWER: US ARMY AIR CORPS. DEC. 20, 2017: THERE ARE TWO THINGS WRONG WITH THE CURRENT SD LICENSE PLATES, ACCORDING TO SD LAW. WHAT ARE THEY? ANSWER: THE BACKGROUND IS TOO DARK, AND WASHINGTON HAS HIS HEAD TURNED. DEC. 14, 2017: GIVE US THE NAME, AND THE PLACE OF EMPLOYMENT OF THE 2016 LIBRARIAN OF THE YEAR FOR SOUTH DAKOTA. ANSWER: TERRI EWALD- WEBSTER CITY LIBRARY. DEC. 4, 2017: SD IS KNOWN AS THE "HOSTING" CAPITOL OF THE WORLD, FOR FOUR REASONS. WHO ARE THOSE FOUR? ANSWER: BOB BARKER, MARY HART, PAT O'BRIEN, AND TOM BROKAW. NOV. 28, 2017: IT IS SOUTH DAKOTA'S LARGEST PERMANENT PUBLIC MODEL RAILROAD DISPLAY. WHO PUT IT TOGETHER, AND WHERE IS IT? ANSWER? NOV. 21, 2017: PRIOR TO LATI BEING FORMED IN 1965, THERE WERE SOME TECHNICAL CLASSES BEING HELD IN WATERTOWN, WHICH HELPED LEAD TO THE FORMATION OF LATI. WHAT WAS THE FIRST CLASS TAUGHT AND WHERE WAS IT HELD? ANSWER: OFFICE MACHINES IN THE BASEMENT OF MCKINLEY SCHOOL. NOV. 13, 2017: THE ORANGE MOUNTAIN DANDELION IS AN EXTREMELY RARE PLANT IN SD, BUT IT IS OFTEN FOUND IN ONE GENERAL AREA IN THE STATE. WHERE IS IT? ANSWER: THE BLACK HILLS. NOV. 9, 2017: FROM 1976-1979 BERESFORD HIGH SCHOOL HAD A TEAM THAT WENT UNDEFEATED IN AAA COMPETITION. WHAT TEAM WAS IT? ANSWER: MARCHING BAND. NOV. 8, 2017: WHAT IS THE OLDEST SURVIVING BUSINESS IN SOUTH DAKOTA? ANSWER: NORBERG PAINT IN SIOUX FALLS. NOV. 2, 2017: THE FIRST MINUTEMAN MISSLE ACCIDENT EVER HAPPENED NEAR WHAT SD COMMUNITY? ANSWER: VALE. OCT. 17, 2017: FLOYD RED CROW WESTERMAN, WAS AWARDED THE HIGHEST HONOR OF NORTHERN STATE UNIVERSITY. WHAT IS THAT AWARD? ANSWER: DISTINGUISHED ALUMNI AWARD. OCT. 10, 2017: HAMLIN COUNTY HAD A CONSERVATION OFFICER, HIS NAME WAS BROOK BROWN, WHAT SAYING WAS HE WELL KNOWN FOR? ANSWER: FISH ON!! OCT. 5, 2017: THE SEC. OF AGRICULTURE, EZRA TAFT BENSON, WAS SPEAKING IN SD, AND THEY THREW EGGS AT HIM. WHAT SPECIAL EVENT WAS HE ATTENDING? ANSWER: THE CORN PICKING CONTEST. SEPT. 26, 2017: A SCULPTURE IN SD NAMED WILLIE WEATHER WATCHER STANDS WHERE, AND WHO CREATED IT? ANSWER: HE'S IN THE FRONT OFFICE THE WATERTOWN PUBLIC OPINION AND WAS CREATED BY RON WALKER. SEPT. 21, 2017: SD HAS TWO WORLD CHAMPIONS FROM OLERICH. WHAT ARE THEY WORLD CHAMPIONS IN? ANSWER: BRONC RIDING AND BARREL RACING. SEPT. 19, 2017: INVENTED IN SD, IT'S CALLED THE DOOR-HICKEY. WHAT IS IT, AND WHERE WAS IT INVENTED? ANSWER: IT IS A SLIDING DOOR OPENER FOR YOUR ELBOW, AND WAS INVENTED IN BROOKINGS. SEPT. 18, 2017: THERE ARE THREE GEOGRAPHICAL FORMATIONS IN SD SMALLER THAN CANYONS WITH MANY OF THE SAME FEATURES. TWO IN WESTERN SD, ONE IN EASTERN SD. WHERE IS THE ONE IN EASTERN SD, AND WHAT IS ITS' NAME? ANSWER: BIG COULEE WEST OF WILMOT. SEPT. 13, 2017: WHICH RESTAURANT WITHIN 50 MILES OF WATERTOWN, DISASSEMBLED THEIR BOWLING ALLEY AND MADE TABLES OUT OF IT? ANSWER: CHARGER CAFÉ IN HAYTI. SEPT. 12, 2017: REPTILE GARDENS GOT OFF TO A SLOW START, UNTIL THE FOUNDER ADDED A NEW, DANGEROUS ATTRACTION. WHAT WAS IT? ANSWER: ALLIGATOR WRESTLING. SEPT. 6, 2017: WHAT IS THE NAME OF THE SOUTH DAKOTAN WHO BATTLED MOONSHINERS ON THE YANKTON SIOUX RESERVATION, AND SERVED AS A BODYGUARD FOR CALVIN COOLIDGE? ANSWER: AL CAPONE'S BROTHER, JAMES. SEPT. 5, 2017: HOW DID JOE FOSS' FATHER DIE? ANSWER: HE DROVE OVER A LIVE ELECTRICAL CABLE. AUGUST 29, 2017: JOSEF MEIER BUILT A LANDMARK IN THE BLACK HILLS. WHAT DID HE BUILD? ANSWER: THE AMPHITHEATER FOR THE PASSION PLAY. AUGUST 28, 2017: WHAT MONTH, DAY, AND YEAR WAS GROUND BROKEN ON THE CURRENT WATERTOWN POST OFFICE? ANSWER: MAY 23, 1975. AUGUST 17, 2017: ABERDEEN, IPSWICH, PLANKINTON, TIMBER LAKE, RAPID CITY, AND ST. FRANCIS EACH HAD ONE. IT NO LONGER EXISTS IN ANY OF THOSE CITIES. WHAT WAS IT? ANSWER: THEY ALL HAD "PALACES ON THE PRAIRIE", SIMILAR TO THE CORN PALACE. AUGUST 15, 2017: IT WAS CALLED THE GREATEST DISPLAY OF GRAIN EVER SHOWN BY ANY COUNTRY. WHAT WAS IT, AND IN WHICH SD CITY DID IT EXIST? ANSWER: PLANKINTON GRAIN PALACE. AUGUST 10, 2017: THOMAS FAWICK DID SOMETHING THAT CAUSED THE BIGGEST CONTROVERSY FOR THE STATE'S YOUNGEST MAYOR. WHAT WAS IT? ANSWER: HE PURCHASED THE STATUE OF DAVID IN SIOUX FALLS. AUGUST 7, 2017: CARRIE NATION, THE CRUSADER FOR PROHIBITION, HAD A REPUTATION FOR SMASHING DRINKING ESTABLISHMENTS. IN SD, SHE STRUCK A DEAL WITH A DEADWOOD BAR OWNER TO SMASH ONLY WHAT IN HIS ESTABLISHMENT? ANSWER: CHEAP BOTTLES OF BOOZE AND MIRROR. AUGUST 3, 2017: WHAT IS "SEARCHING FOR (OR ASTRIDE) THE WHITE MULE"? ANSWER: A BOOK ABOUT PROHIBITION IN SD. AUGUST 1, 2017: IN 1923, THE STATE OF SD CONSTRUCTED ITS' FIRST WHAT? ANSWER: PAVED HIGHWAY. JULY 31, 2017: GOV. PETER NORBECK HIRED JOHN KIRKHAM TO BUILD WHAT SOUTH DAKOTANS HAD WANTED FOR A LONG TIME. WHAT DID HE BUILD? ANSWER: BRIDGES ACROSS THE MISSOURI RIVER. JULY 27, 2017: ACCORDING TO THE SD STATE SONG, HAIL SOUTH DAKOTA, THREE THINGS MAKE OUR STATE GRAND. WHAT ARE THEY? ANSWER: HEALTH, WEALTH, AND BEAUTY. JULY 11, 2017: ALTHOUGH PRES. JAMES BUCHANAN NEVER HAD A STRONG REPUTATION, HE DID SOMETHING IMPORTANT FOR SOUTH DAKOTA. WHAT WAS IT? ANSWER: HE SIGNED THE DOCUMENTS CREATING DAKOTA TERRITORY. JULY 7, 2017: BEFORE IT WAS ELLSWORTH AIR FORCE BASE, IT WAS NAMED WHAT? ANSWER: WEAVER AIR FORCE BASE. JULY 5, 2017: IN 1969 THE FAA HONORED THE SOUTH DAKOTA AERONAUTICS MECHANIC OF THE YEAR. WHO WAS IT? ANSWER: LAVERNE KRAMER. JUNE 28, 2017: IN 1904 AN EASTERN FIRM EXAMINED THIS MINE, AND OFFERED THE PARTNERS A CERTIFIED CHECK FOR $84,000 TO BUY IT. ONE OF THE OWNERS, WHO WAS VERY INTOXICATED, TOLD THEM $100,000 OR NOTHING. THE DEAL FELL THROUGH, AND HE DIED A PAUPER. WHAT BLACK HILLS MINE WAS IT? ANSWER: THE COMET MINE. JUNE 15, 2017: WHAT IS THE NUMBER ONE COMPLAINT HEARD IN TREASURERS OFFICE IN SOUTH DAKOTA? ANSWER: PLATES ON TRAILERS ARE TOO SMALL. JUNE 14, 2017: GIVE US THE NAME OF THE FIRST DEAF PERSON TO EARN A PILOT'S LICENSE IN THE US. WHERE IS SHE FROM, AND WHAT IS HER NAME? ANSWER: NELLIE WILLHITE FROM BOX ELDER, SD. JUNE 12, 2017: SMOKE JUMPERS WERE USED IN SD STARTING IN WHAT YEAR, AND WERE PHASED OUT OF SERVICE IN WHAT YEAR? ANSWER: 1959 AND 1969. JUNE 6, 2017: LAKE AREA TECH SOLD AN AIRPLANE TO FUND THE BEGINNING OF THEIR AVIATION PROGRAM. WHAT AIRPLANE DID THEY SELL? ANSWER: DEHAVILLAND BEAVER. JUNE 2, 2017: WHAT'S CONSIDERED TO BE THE OLDEST WORKS OF MAN IN SD? ANSWER: THE INDIAN MOUNDS. MAY 15, 2017: ONLY TWO STATES SHARE A BORDER COMPLETELY AND PERMANENTLY MARKED. WHAT ARE THE MARKERS MADE OF, AND HOW MANY OF THEM ARE THERE? ANSWER: SD AND ND HAVE 720 QUARTZITE MARKERS ALONG THEIR BORDERS. MAY 12, 2017: HOVEN, SD HAS A CHURCH THAT WAS BUILT AS A CATHEDRAL OF THE PRAIRIE, WHY CAN'T IT BE CALLED A CATHEDRAL? ANSWER: THEY DON'T HAVE A BISHOP. MAY 9, 2017: PRESIDENT JEFFERSON CHOSE CAPT. MERIWETHER LEWIS, A COUSIN OF GEORGE WASHINGTON, TO HEAD A PARTY OF EXPLORES TO THE LOUISIANA PURCHASE. WHAT POSITION DID LEWIS HOLD IN THE GOVERNMENT? ANSWER: JEFFERSON'S PERSONAL SECRETARY. MAY 1, 2017: WHO WAS THE FOUNDER OF KRANZBURG? APRIL 28, 2017: WHAT DELICACY WAS INTRODUCED IN HUTCHINSON CO. IN THE 1880'S? ANSWER: CHISLIC FROM RUSSIA. APRIL 25, 2017: THIS MINE IN THE BLACK HILLS WAS LOCATED BY CALIFORNIA JOE AND JACK HUNTER. WHAT WAS THE NAME OF THE MINE? ANSWER: CHIEF OF THE HILLS. APRIL 14, 2017: WHICH ASSOCIATION IS CREDITED WITH INTRODUCING AVIATION IN SD? ANSWER: SD STOCKGROWERS ASSN. APRIL 11,2017: WHAT DO THE COMMUNITIES OF WATERTOWN, HARTFORD, HAZEL, ESTELLINE, HAYTI, TEA, AND HUMBOLDT HAVE IN COMMON? ANSWER: LOCATIONS OF RELIABANK. APRIL 7, 2017: WHAT WAS KYLE EVANS' NICKNAME? ANSWER: THE SINGING TROUBADOUR. APRIL 6, 2017: A SD LAWMAKER IS KNOWN FOR HIS BLACK HAT, FRIENDLY SMILE, AND WHEELCHAIR. WHO IS HE, AND WHAT PUT HIM IN THE WHEELCHAIR? ANSWER: BILLIE SUTTON, WHO WAS INJURED IN A RODEO ACCIDENT. MARCH 30, 2017: WHAT DID CONGRESS DO THAT CAUSED MANY MUSICAL INSTRUMENTS TO BECOME OBSOLETE, WHICH THEN LED TO THE CREATION OF THE NATIONAL MUSIC MUSEUM IN VERMILLION? ANSWER: THEY CREATED A NEW PITCH LEVEL, CHANGING THE AMOUNT OF VIBRATIONS IN EACH OF THE NOTES. MARCH 29, 2017: WHO IS THE MAN IN SOUTH DAKOTA WHO CREATED THE FIRST MOTHER'S DAY? ANSWER: GOV. ROBERT VESSEY. MARCH 27, 2017: WOUNDED KNEE, 1973, A BUILDING WAS BURNT DOWN. WHAT WAS THE NAME OF THAT BUILDING? ANSWER: SACRED HEART CATHOLIC CHURCH. MARCH 14, 2017: IT WAS FORMED IN 1959 IN SD. THE ENGINEERS PLANNED TO WORK ON GOVERNMENT CONTRACTS, BUT IT EVOLVED. ED YOST WAS THE FATHER OF THIS INDUSTRY. WHAT INDUSTRY WAS IT? ANSWER: RAVEN INDUSTRIES. MARCH 10, 2017: WHEN LAWRENCE WELK WAS HIRED TO PERFORM ON WNAX RADIO IN YANKTON, WHAT WAS THE NAME OF HIS BAND? ANSWER: THE HONOLULU FRUIT GUM BOYS. MARCH 6, 2017: VIC'S PLACE, THE DEPOT, AND TACO TOWNE ALL HAVE SOMETHING IN COMMON. WHERE ARE THEY, AND WHAT DO THEY HAVE IN COMMON? ANSWER: VIC'S PLACE IS IN DIMOCK, THE DEPOT IS IN ABERDEEN, AND TACO TOWNE IS IN VERMILLION. ALL OF THEM ARE GOING TO BE INDUCTED INTO THE SOUTH DAKOTA ROCK AND ROLL HALL OF FAME THIS YEAR. FEBRUARY 20, 2017: GUTZOM BORGLUM SET OFF A BLAST OF DYNAMITE TO IMPRESS ONE PERSON. WHO WAS HE TRYING TO IMPRESS? ANSWER: FRANKLIN ROOSEVELT. FEBRUARY 16, 2017: WHAT COUPLE IS CONSIDERED TO BE THE MOTHER AND FATHER OF SPELUNKING IN SD? ANSWER: HERB & JAN CONN.
FEBRUARY 14, 2017: IN SD, THERE IS A FORMER HOSPITAL TURNED BEAUTY SHOP, TURNED WOMEN'S CLOTHING STORE, AND NOW A PRIVATE RESIDENCE ON THE HISTORIC REGISTER, THAT IS KNOWN BY AN UNUSUAL NAME. WHAT IS IT CALLED, AND WHERE IS IT? ANSWER: THE ONION HOUSE IN DELMONT. JANUARY 23, 2017: A PUBLIC AREA IN SD CARRIES THE SAME NAME AS SOMEONE AT KXLG. WHERE IS THE PUBLIC AREA, AND WHAT IS IT? ANSWER: FAEHN GAME PRODUCTION AREA, TWO MILES WEST OF WALLACE. DECEMBER 28, 2016: HIS FATHER WANTED HIM TO BE A CARPENTER, BUT HE WENT TO LAW SCHOOL. BUT, HE QUIT AFTER THREE YEARS, AND TRIED SELLING INSURANCE, BUT WAS FIRED TWICE. HE WENT ON TO RUN HIS OWN NATIONAL BUSINESS FROM SD. WHO IS IT? ANSWER: OSCAR AUSTAD - AUSTAD'S GOLF. Is it a bird? Is it a plane? No!… It’s the Watertown iconic Weather Ball overlooking the KXLG radio station at 835 Jenson Ave, south east of the intersection of Highway 212 and Highway 81. Since being lit for the first time on May 22, 2014 as part of KXLG Radio’s spectacular ribbon cutting at their new location, the weather ball has been a way for KXLG listeners and Watertown residents to stay up-to-date on how the forecast will be that day. To view what the color definitions are, just click on the image to the right. 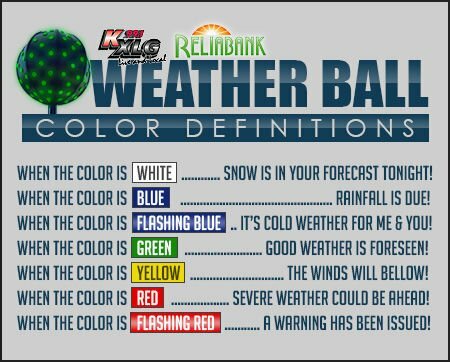 The weather ball is sponsored by KXLG and Reliabank and can also be programmed to flash patriotic colors to celebrate holidays or to a pink color for National Breast Cancer Awareness month.